I volunteer my services to the Bay Area Genealogical Society (BAGS). We meet at 6:30 PM on the last Friday of every month at University Baptist Church, 16106 Middlebrook Drive, Houston, TX 77059 (Clear Lake City). How to start a “Family Tree” on Family Search. “5 Minute Genealogy” Video Series. “Family Tree” Training Lessons and Videos. How to use the Family Search Wiki. A local Family Search center- one of the great things about the Family Search organization is that they have local Family Search centers in thousands of locations around the world. For a list of Family Search centers go here. A public genealogy library- many cities, counties and states provide local public libraries that offer genealogy services. In Houston, we have one of the top genealogy libraries in the United States, the Clayton Library. It is also a Family Search center with the most extensive service hours in our area. Genealogy libraries often provide free or low cost training programs. You will find a list of genealogy libraries here. 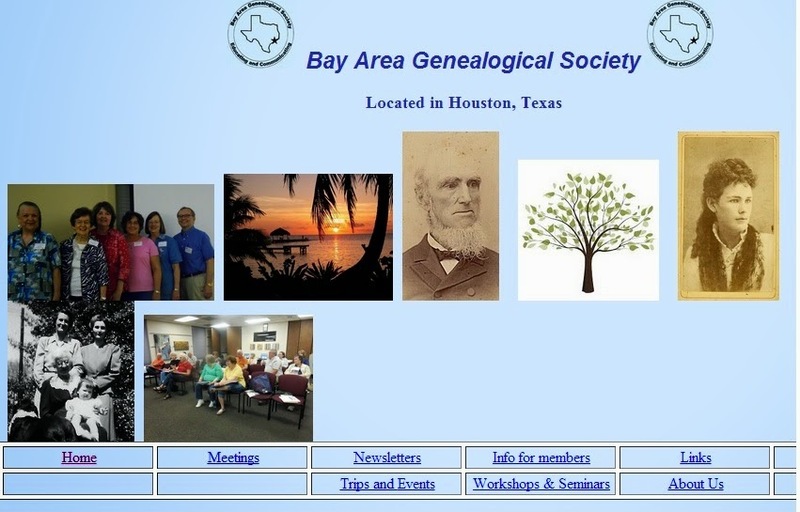 A local genealogy society- BAGS is one example but there are several more societies in the greater Houston and Galveston area. Check this site for a local genealogical society near where you live. BAGS has monthly meetings and we have offered special interest groups based on various ethnic backgrounds including but not limited to British, Irish and African American genealogy. The African American Genealogy Class sponsored by BAGS will meet on the 1st Thursdays at 10:30 AM at Friendswood Public Library on the following dates: August 7, September 4, and October 2. We are planning a special interest group for German ancestry in 2015. The next general meeting of BAGS is our annual Barbecue Dinner and Show & Tell. Members will be making a series of five minute presentations about the heirlooms and stories of their ancestors. Join us at 6:30 PM on Friday, August 29 at University Baptist Church, 16106 Middlebrook Drive, Houston, TX 77059 (Clear Lake City) for our next meeting.